QUINCY, MA--(Marketwire - Nov 1, 2012) - Even though you're on vacation, sometimes a night in is just what you need to get some quality time with the kids. At the Boston Marriott Quincy Hotel, the Family Movie Night package gives you everything you need for a little family fun at this hotel near Boston. With this special hotel deal in Quincy, you'll get deluxe overnight accommodations, a large cheese pizza, four non-alcoholic beverages and one in-room movie -- the perfect recipe for family time. Your guestroom at this hotel near Boston is the ideal place to spend a quiet evening and offers elegant beds outfitted with plush linens, fluffy pillows and comfy duvets, 37-inch flat-screen TVs, high-speed Internet access and coffee/tea service. Once you're ready to leave your comfortable abode, you'll find plenty to explore at this Boston hotel. Spend some time in the fitness center, indoor lap pool or whirlpool. In-house dining includes Adam's Lounge; the casual Kilroy's Irish Pub, offering a menu of appetizers, sandwiches, salads and burgers; and Hancock's, where you'll find fresh steaks, seafood and traditional New England specialties. If you want to go out and explore the area, this hotel near Milton, Massachusetts is close to I-95, I-93 and Route 3, making it easy to get to the JFK Library, US Naval Shipbuilding Museum, Adams Mansion and Plymouth Plantation. To book the Family Movie Night package at this Quincy hotel, visit www.marriott.com/specials/mesOffer.mi?marrOfferId=778826&displayLink=true or call 1-800-228-9290 in the US; be sure to enter/ask for promotional code ZE2. This offer is available through March 31, 2013. To learn more about the Boston Marriott Quincy, visit the hotel website at www.marriott.com/hotels/travel/bosqu-boston-marriott-quincy/, where you can book rooms, browse photos, search additional deals and packages, get transportation and map information and plan your visit with a detailed destination guide. Whether you're here to explore American history, enjoy a quiet weekend or meet with clients and colleagues, the Boston Marriott Quincy offers you easy access to it all. Set along the South Shore, near downtown Boston, Cape Cod, Plymouth, Martha's Vineyard and Nantucket, this Energy Star-certified property is a convenient choice for business and pleasure alike. Guestrooms at this Logan Airport hotel offer high-speed Internet access, desk with ergonomic chair, coffee/tea service, plush bedding and 37-inch flat-screen cable TV. 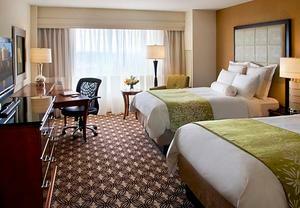 Allergy-friendly and concierge-level rooms are also available. This Quincy hotel, less than 15 miles from downtown Boston, offers a number of amenities including an indoor lap pool, fitness center, whirlpool, business center and 15,000 sq. ft. of meeting and event space. When hunger strikes, choose from three dining venues; Hancock's, offering fresh seafood, steaks and New England specialties; Kilroy's Irish Pub for casual appetizers, sandwiches, burgers and salads; and Adam's Lounge. A location convenient to I-95, I-93 and Route 3 makes it easy to explore the area including the Adams Mansion, Granite Links Golf Course, US Naval Shipbuilding Museum, JFK Library and Plymouth Plantation. At the Boston Marriott Quincy Hotel, the Family Movie Night package gives you everything you need for a little family fun at this hotel near Boston.